High schoolers ordering drinks with their friends, mothers feeding juice to toddlers on their laps, elderly couples sharing the morning newspaper and a flank of laptop users perched at high-tops, tapping into free Wi-Fi—and downloading free music while they’re at it. The afternoon scene at a Denver Starbucks is duplicated a thousand times over in the U.S. and around the world, in more than 20,000 stores. Loyal customers congregate at the church of Starbucks, not just for espresso drinks, but also to hang out. The Seattle-based coffee chain, led by CEO Howard Schultz, set out more than 40 years ago to become that “third place” between home and work—and to the envy of its competitors both inside and outside the coffee segment, it has done just that. Largely credited with defining the specialty-coffee niche, Starbucks has Americans spending $40 billion a year on its coffee, according to research from Food Industry News. Worldwide, about 1.6 billion cups of its coffee are consumed every day. Schultz built Starbucks from a four-unit coffee-bean seller in Seattle to a global chain. It was his vision, after a trip to Italy in the 1980s, to create a different kind of coffee experience; one that engendered a sense of romance around coffee—the smells, the flavors—and that foster ed a sense of community. After going public in 1992, Starbucks’ growth accelerated to a rate of two to six store openings a day. Schultz retired in 2000, but returned eight years later after the company hit a rough patch. Its stock price had plummeted 50 percent, same-store sales declined, consumer spending had dropped and competition had stiffened with chains such as Dunkin’ Donuts and McDonald’s improving their coffee quality and offering espresso drinks. Starbucks closed 600 poor-performing stores. “The recession was really a crucible, and it forged a new Starbucks,” says restaurant analyst Sara Senatore of New York City investment research firm Sanford Bernstein. By the company’s own admission, training slipped. Baristas were not learning the right way to pull espresso shots. One of the first things Schultz did when he returned as CEO in 2008 was to close all U.S. Starbucks stores and give all employees a three-and-a half-hour training session on the right way to make coffee and on improving service. The retraining not only helped Starbucks reclaim its quality, Michelli says, it helped boost employee morale by demonstrating the company’s support for its workers (called “partners”) and making sure they had the tools and knowledge to do their jobs. With Schultz back at the helm, Starbucks charted a recovery strategy that became a platform for steady, controlled growth and set the stage for the success the company is seeing today, Michelli says. Starbucks posted a 25 percent jump in profit for its first fiscal quarter of 2014, which ended Dec. 29, 2013. This increase occurred while traffic was down 17.7 percent from the previous December, according to retail analysis firm ShopperTrak, and while many restaurants and retailers reported lackluster results for the final months of 2013. The full 2013 fiscal year for Starbucks also was a record-setter: the company generated $14.9 billion in revenue. The strategy since Schultz’s return has included better training and employee engagement, updating stores, purchasing food and drink concepts to bolster its own menu offerings, using technology to improve the customer experience and staying focused on international growth. Over the past few years, Starbucks has remodeled stores to keep them attractive and inviting, says Brian Sozzi, CEO and chief equities strategist for Bolus Capital in New York City. It reportedly lowered counters so guests could see the coffee beans atop the espresso machines as well as smell the freshly ground beans as drinks were being made. Starbucks also has not been afraid to push the design boundaries. It has begun rolling out new stores inspired by and designed to represent the communities in which they’re located—further muscling in on the territory of smaller neighborhood coffeehouses. A new store that opened last month in Austin, Texas gives a nod to the city’s rich music history by incorporating speakers into the paneling and using microphones in the chandeliers, among other touches. A recently opened Starbucks in New Orleans’ French Quarter was designed to look like it belonged to a Louisiana merchant in the early 1900s. And because it’s New Orleans, there’s a trombone light fixture, of course. In addition to improving the look of stores, Starbucks has made key acquisitions recently to enhance its food and beverage portfolio. In 2012, Starbucks acquired 300-unit Teavana, based in Atlanta. The mall retailer of loose teas and upscale tea-brewing equipment saw its net sales soar 38 percent to $46 million that year. Starbucks opened the first two flagship Teavana tea bar concepts in New York City and Seattle in 2013 and has plans for more stores this year. Revenue and operating income from Teavana were included in the “All Other Segments” category in Starbucks’ first quarter earnings report. Net revenue for the category was $159.2 million, a 174 percent increase over the same period last year, primarily due to the addition of the Teavana business, according the the report. In its own stores, Starbucks has begun offering juices from Bellevue, Wash.-based Evolution Fresh and baked goods from San Francisco’s La Boulange Bakery. It acquired Evolution Fresh for $30 million in 2011 and La Boulange for $100 million in 2012. Troy Alstead, who was recently promoted from chief financial officer to chief operating officer, told analysts on a January conference call that food sales during the lunch hour and afternoon were outpacing food sales at other times of the day during the first quarter of 2014. Croissant sales have doubled in stores offering La Boulange pastries. Sales also are up for morning buns and cheese danishes. Schultz downplayed those concerns. Nothing suggests there’s a thoughput issue, Schultz told analysts. “Because of the Starbucks card and the quick adoption of mobile payment, we are speeding up the level of service in our stores,” Schultz said. 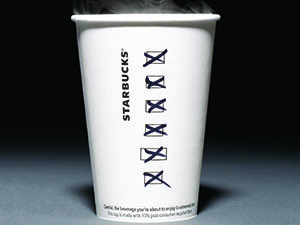 Analysts and observers credit Starbucks with staying ahead of the curve by embracing mobile technology. The coffee company became an early adopter of mobile payments in 2011. “Starbucks is very much leading the way for restaurants when it comes to digital technology,” Sozzi says. In addition to plastic loyalty and gift cards guests can load with cash, Starbucks created digital versions that can be accessed on smartphones. Such investments helped Starbucks navigate a shift in consumer spending that was most notable during the recent holiday season, Schultz told analysts in January. Foot traffic gave way to more online shopping, including purchases on mobile devices, and it was the first holiday in which consumers whole-heartedly embraced traditional and digital gift cards, Schultz said. Starbucks processed more than 40 million new Starbucks cards that were loaded with more than $620 million in the U.S. and Canada in the first quarter of 2014, according to its earnings report. Up to two million new Starbucks cards were activated per day in the time leading up to Christmas, and $1.4 billion was loaded onto Starbucks cards globally in December. “We have never been more nimble in terms of our ability to respond using our digital assets,” Adam Brotman, chief digital officer for Starbucks told analysts during the January earnings call. Starbucks also has used social media to engage customers and employees, Michelli says. Last year was the fifth anniversary of My Starbucks Idea, a sort of online suggestion box. The site has received more than 150,000 submissions that helped launched 275 ideas into Starbucks stores, such as enabling cashiers to add a gratuity when a customer pays with a Starbucks card. Starbucks also is the restaurant where customers take Instagram photos the most; more than 109,000 photos were posted during a three-month period in 2013, according to MomentFeed. The Starbucks Facebook page has more than 36 million likes. On its Facebook page for employees, which has more than 50,000 fans, Starbucks encourages staff to post pictures and comments about their work life. And employees have posted 84,000 images on Instagram under the Starbucks’ hash tag #tobeapartner. A continuing strategy of staying focused on training and keeping employees engaged, acquiring brands that resonate with consumers and connecting with customers through social media and in restaurants bodes well for Starbucks in the near future, analysts say. In its first quarter fiscal report, Starbucks projected revenue growth in 2014 to improve by 10 percent. Global same-store sales will grow in the mid-single digits, and Starbucks will add some 1,500 new stores worldwide in 2014, including 600 in the U.S. and Canada. The outlook for Starbucks continues to be strong, analysts say, particularly as the specialty-coffee market grows and as more young people are increasing their coffee consumption. The Specialty Coffee Association of America reported in 2012 that 40 percent of 18–24 year olds say they drink coffee daily, up from 31 percent in 2010. Fiscal 2013 was a record breaker in Starbucks’42 years of business. It generated revenues of $14.9 billion. Its $813.5 million in net income was a 29 percent increase. 417 new stores were opened around the world, bringing the store count to 20,134. That includes 4,000 in China and the Asian Pacific, and 2,000 in Europe and the Middle East. Same-store sales rose 8%in Asia and were up by 5 percent in Europe and the Middle East. 13,000 stores are in operation in the Americas region encompassing the United States, Canada, Brazil and Puerto Rico. Same-store sales here rose 5 percent over the prior year’s first quarter, driven by a 4 percent increase in customer traffic. $1.4 billion was uploaded to Starbucks Cards worldwide. The My Starbucks Rewards program has 7 million active members in the U.S.